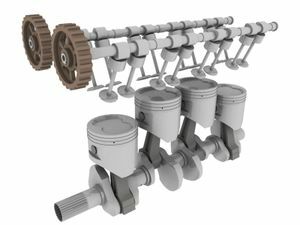 The Inline-four engine or Straight-four engine is an internal combustion engine with all four cylinders mounted in a straight line, or plane along the crankcase. The single bank of cylinders may be oriented in either a vertical or an inclined plane with all the pistons driving a common crankshaft. Where it is inclined, it is sometimes called a slant-four. In a specification chart or when an abbreviation is used, an inline-four engine is listed either as I4 or L4 (for longitudinal, to avoid confusion between the digit 1 and the letter I). The inline-four layout is the simplest design which is in perfect primary balance and confers a degree of mechanical simplicity which makes it popular for economy cars. However, despite its simplicity, it suffers from a secondary imbalance which causes minor vibrations in smaller engines. These vibrations become worse as engine size and power increase, so the more powerful engines used in larger cars generally are more complex designs with more than four cylinders. Classic and Antique vehicles tended to have larger displacements to develop horsepower and torque. The Model A Ford was built with a 3.3 L inline-four engine. Four-cylinder diesel engines, which are lower revving than gasoline engines, often exceed 3.0 L. Mitsubishi still employs a 3.2 L four-cylinder turbodiesel in its Pajero (called the Shogun or Montero in certain markets), and Tata Motors employs a 3.0 L four-cylinder diesel in its Spacio and Sumo Victa. The Toyota B engine series of diesel engines varies in displacement from 3.0- 4.1 L. The largest engine in that series was used in the Mega Cruiser. Larger four-cylinder engines are used in industrial applications, such as in small trucks and tractors, are often found with displacements up to about 4.6 L. Diesel engines for stationary, marine and locomotive use (which run at low speeds) are made in much larger sizes. Displacement can also be very small, as found in kei cars sold in Japan, such as the Subaru EN series; engines that started out at 550 cc and are currently at 660 cc, with variable valve timing, DOHC and superchargers resulting in engines that produce Template:Convert. The inline-four engine is much smoother than one, two, and three cylinder engines, and this has resulted in it becoming the engine of choice for most economy cars, although it can be found in some sports cars as well. However, the inline-four is not a fully balanced configuration. An even-firing inline-four engine is in primary balance because the pistons are moving in pairs, and one pair of pistons is always moving up at the same time as the other pair is moving down. However, piston acceleration and deceleration are greater in the top half of the crankshaft rotation than in the bottom half, because the connecting rods are not infinitely long, resulting in a non sinusoidal motion. As a result, two pistons are always accelerating faster in one direction, while the other two are accelerating more slowly in the other direction, which leads to a secondary dynamic imbalance that causes an up-and-down vibration at twice crankshaft speed. This imbalance is tolerable in a small, low-displacement, low-power configuration, but the vibrations get worse with increasing size and power. Most inline-four engines below 2.0 L in displacement rely on the damping effect of their engine mounts to reduce the vibrations to acceptable levels. Above 2.0 L, most modern inline-four engines now use balance shafts to eliminate the second-order harmonic vibrations. In a system invented by Dr. Frederick W. Lanchester in 1911, and popularised by Mitsubishi Motors in the 1970s, an inline-four engine uses two balance shafts, rotating in opposite directions at twice the crankshaft's speed, to offset the differences in piston speed. However, in the past, there were numerous examples of larger inline-fours without balance shafts, such as the Citroën DS 23 2,347 cc engine that was a derivative of the Traction Avant engine, the 1948 Austin 2,660 cc engine used in the Austin-Healey 100 and Austin Atlantic, the 3.3 L flathead engine used in the Ford Model A (1927), and the 2.5 L GM Iron Duke engine used in a number of American cars and trucks. Soviet/Russian GAZ Volga cars and UAZ SUVs, vans and light trucks used aluminium big-bore inline-four engines (2.5 or later 2.9 L) with no balance shafts from the 1950s-1990s. These engines were generally the result of a long incremental evolution process and their power was kept low compared to their capacity. However, the forces increase with the square of the engine speed — that is, doubling the speed makes the vibration four times worse — so modern high-speed inline-fours have more need to use balance shafts to offset the vibrations. Four cylinder engines also have a smoothness problem in that the power strokes of the pistons do not overlap. With four cylinders and four cycles to complete, each piston must complete its power stroke and come to a complete stop before the next piston can start a new power stroke, resulting in a pause between each power stroke and a pulsating delivery of power. In engines with more cylinders, the power strokes overlap, which gives them a smoother delivery of power and less vibration than a four can achieve. As a result, six- and eight- cylinder engines are generally used in more luxurious and expensive cars. The smallest production motorcycle inline-four engine was the four-stroke engine powered the 231 cc Benelli/Moto Guzzi 254. For racing, Honda built inline-four engines as small as a 125 cc for the Honda 125/4. This engine was replaced by a 125 cc straight-five engine. The largest proprietary inline-four engine in a commercially-produced motorcycle is the 1402 cc engine in the Suzuki GSX1400. 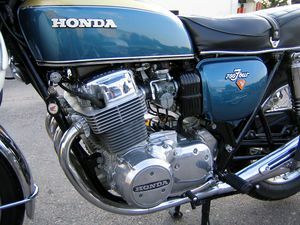 Modern inline-four motorcycle engines first gained their popularity with Honda's SOHC CB750 in the 1970s. Since then, the inline-four has become one of the most common engine configurations in street bikes. Outside of the cruiser category, the inline-four is simply the most common configuration because of its relatively high performance-to-cost ratio. All of the Japanese motorcycle manufacturers offer motorcycles with inline-four engines, as does MV Agusta and BMW who employ both longitudinal and transverse-mounted engines. Even the modern Triumph company has offered inline-four-powered motorcycles, though they were discontinued in favour of a triple. The 2009 Yamaha R1 has an interesting inline-four engine that does not fire at even intervals of 180°. Instead, it uses a crossplane crankshaft that prevents the pistons from simultaneously reaching top dead centre. This results in increased torque at lower engine speeds. This page was last edited on 23 November 2010, at 21:46.